We here at MoparOnlinePerformance.com can't wait for the arrival of the all new 2020 Jeep Gladiator! 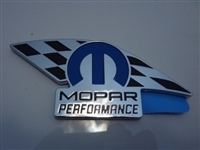 As with all Jeep models, we will be offering Mopar's full line of Mopar Performance Parts, including performance wheels, cold air intakes, and lift kits. Please bookmark our page and check back with us to browse through our full catalog of discounted genuine Mopar Performance accessories for the brand new Jeep Gladiator! The emblem applies with a 2 sided tape already applied to the emblem. Can be applied to any flat surface.